Living in Bangalore helps you to relish foods from different South India states. You can taste major dishes from Karnataka, Kerala, Andhra Pradesh and Tamil Nadu. For me, getting foods from different states sounds like a really good experience. So, when my office Mathew told me that there is good Kerala food mess nearby, I did not miss the chance the chance to go there and experience some good food. 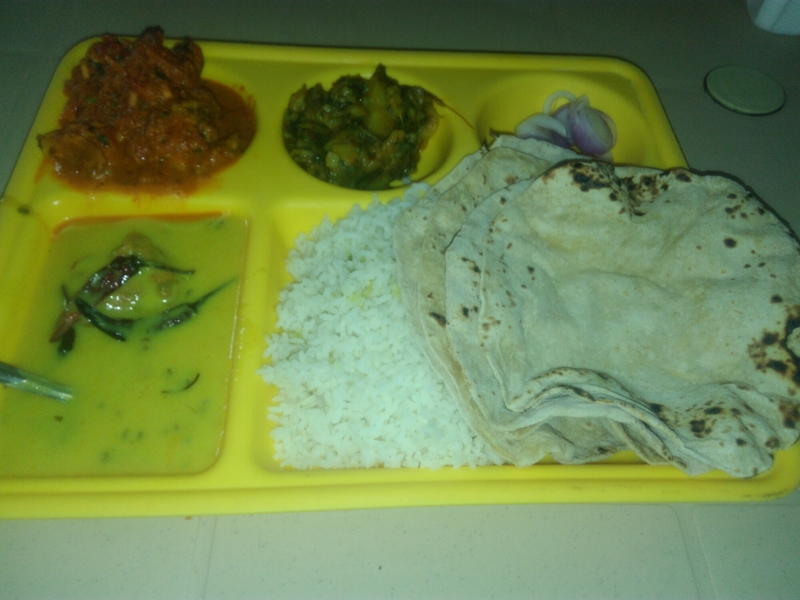 On my first day visit at ‘Elite Mess – Kerala Style’, I ordered veg. thali. I was really impressed by the food quality there. And today, I went there and ordered half-plate chicken Biryani. 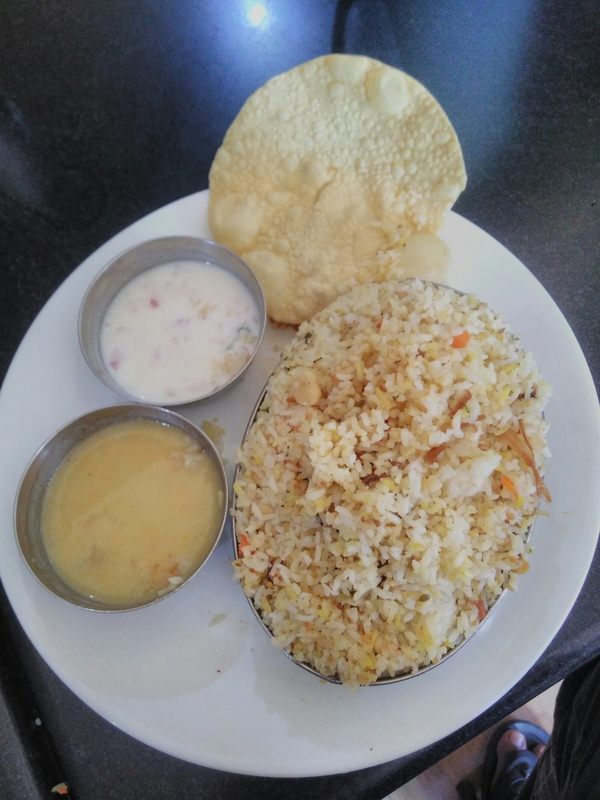 This was the first time I ate Malayalee Biryani and I more or less liked it. 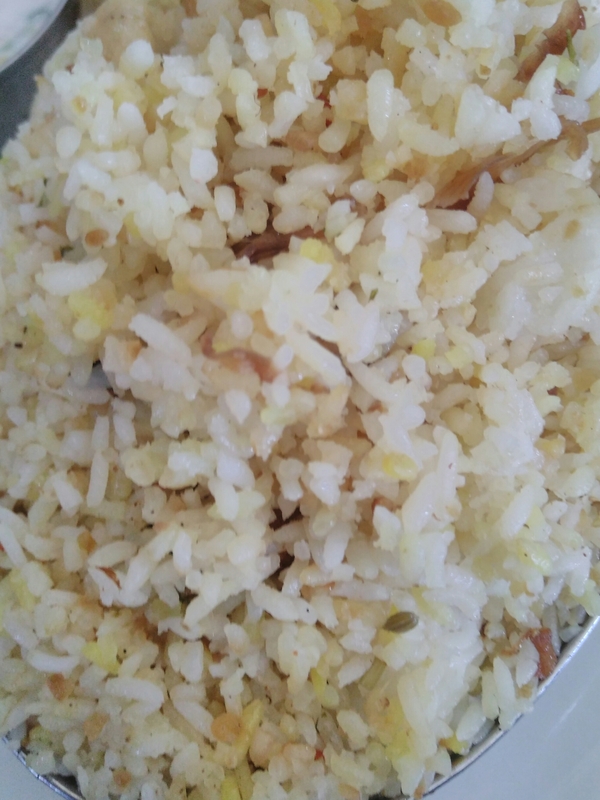 How was the taste of Malayalee Biryani? It is difficult to express in words. But it is like cooking Pulao without sweets and with slight Biryani masala. The Biryani contained one boiled egg, one chicken piece with bone. 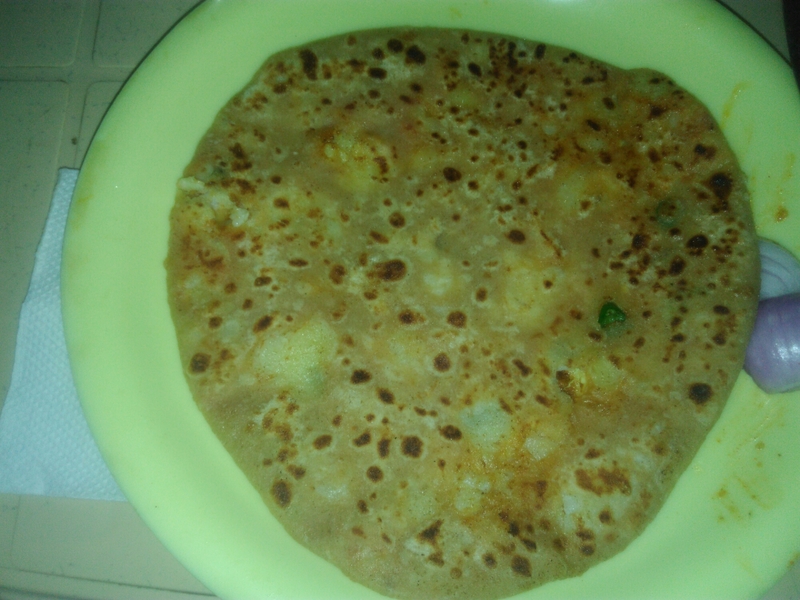 And it was served with curd, one Paayes like dish (sweet) and one papad! I never thought before that Biryani can be served with papad! 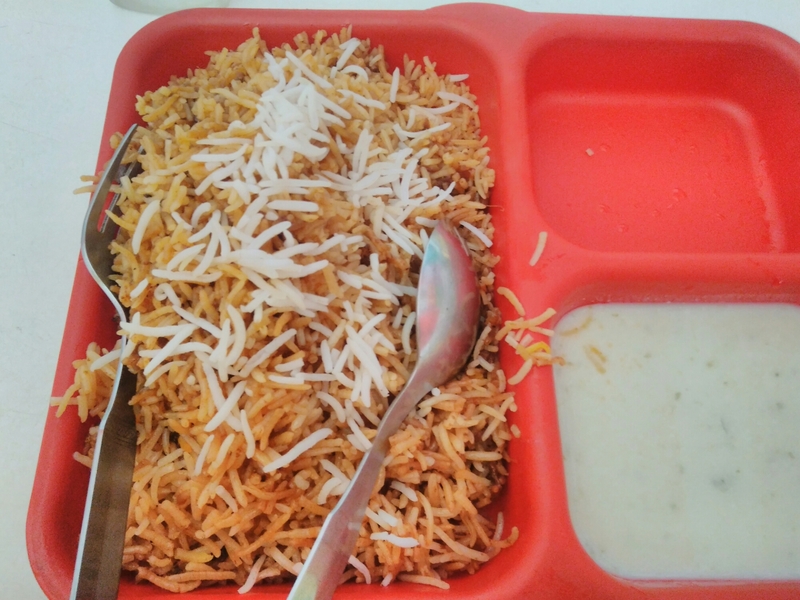 So the Malayalee Biryani at Elite Mess indeed surprised me. After eating Malayalee Chicken Biryani, I was not feeling too well. I thought that eating light at night will be a good option. 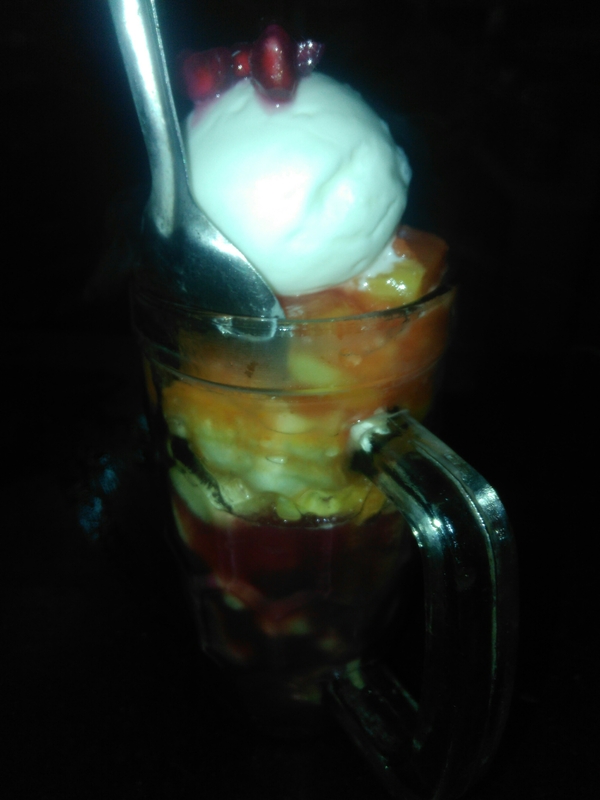 So, at night I bought Butter Scotch icecream bar, mixed the icecream with chopped fruits and ate. That is how I ended the Saturday night dinner. As a Biryani lover, I was not very happy when I tasted Dum Biryani in Bangalore. Actually, the quality of rice they use in Bangalore, was not like something I ate in Kolkata. 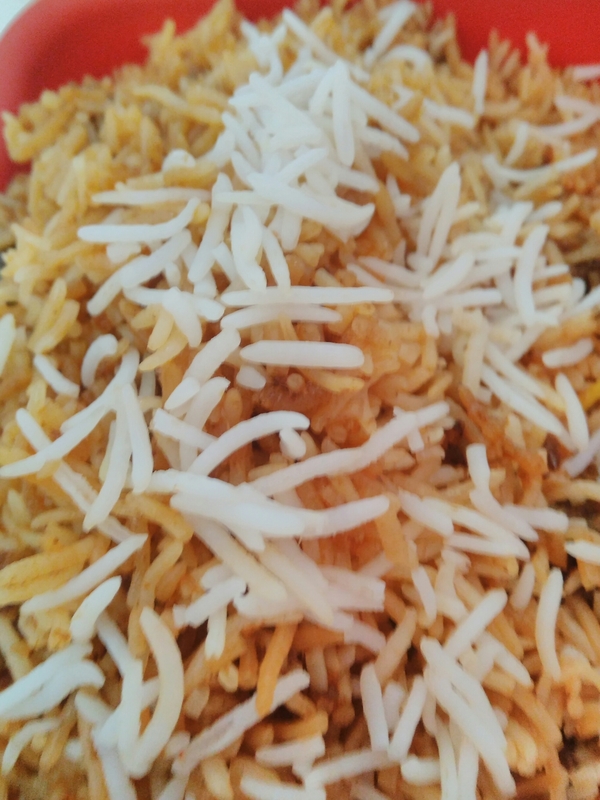 The biryani rice here is short in length. But thankfully there are some food restaurants and retail shops that give the opportunity to taste other types of Biryanis as well. Last week I went to Ammi’s Biryani retail shop. They offer Hyderabadi Chicken Biryani. You can order for Executive (with less rice) or as full plate. I found his answer to be true while eating the Biryani. And I must say, for the first time I tasted a really good biryani in Bangalore. Starting Sunday with a good breakfast is nice way to enjoy weekend. I try to do it after waking up very late from the bed. 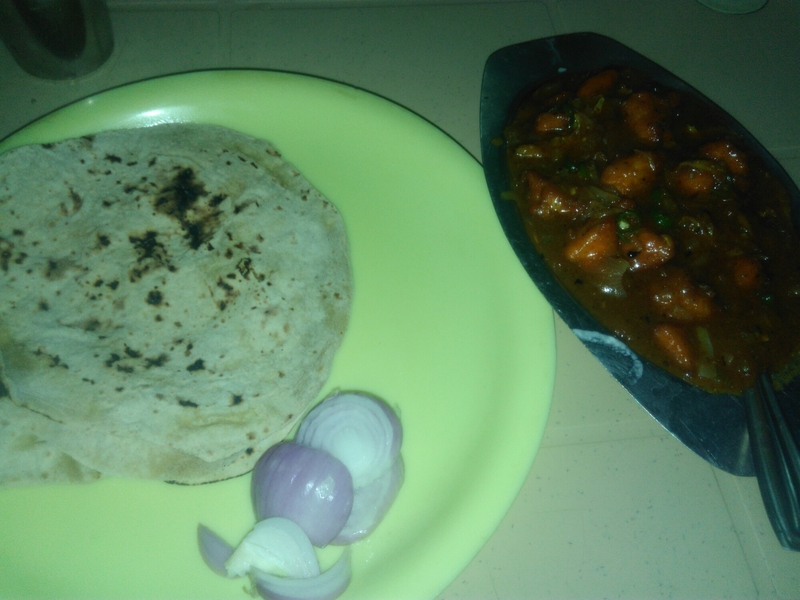 This Sunday, I went Raghavendra Food Centre and had a mix of North Indian and South Indian foods. I first ordered a plate of Puries (5 Puries in each plate) which is a general North Indian food. 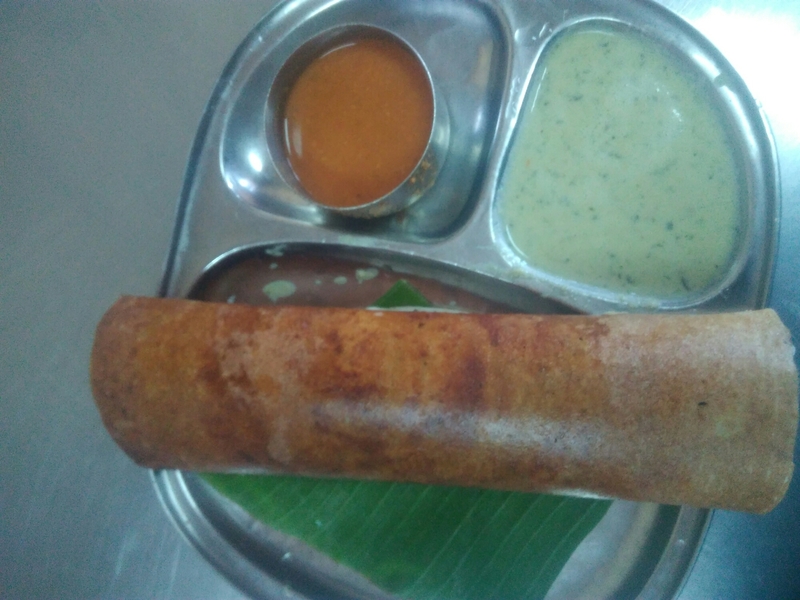 Next, I thought why not give a try to Masala Dosa? The Masala Dosa’s size was really grand and the taste was delicious. If you eat two Masala Dosas, you won’t be able to eat lunch! Your stomach will be full. 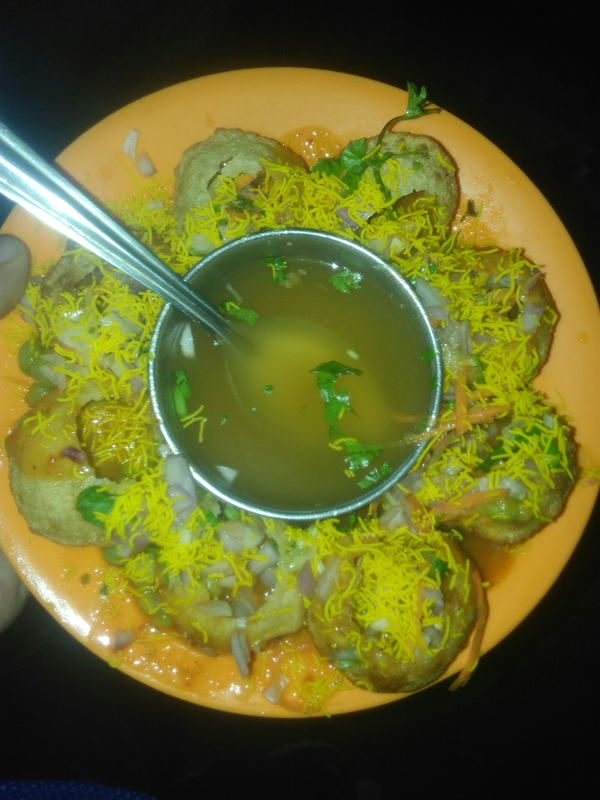 Phuchka or Panipuri is really tempting. Remember the scene of the movie Dangal? But not only girls, boys and kids also love it as well. So, when I saw a street food shop was offering it, I could not resist myself. At Rs. 20/- only, 7-8 panipuris were a good buy. Additionally, the serving person added churmur, sweet chutney or pickle and curd. That tasted awesome. 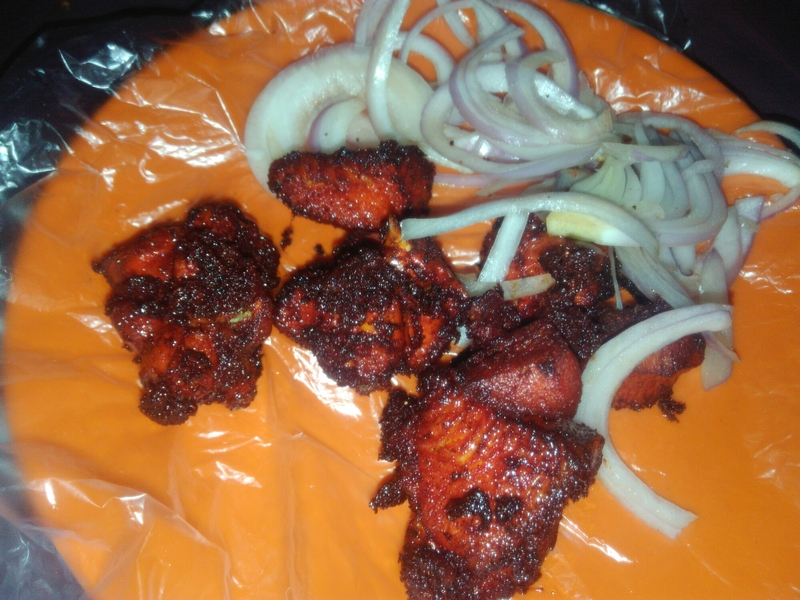 For those who can’t taste this Bengaluru panipuris, at least see the picture of it! “What can I have for Lunch?” I was thinking about it. I wanted something special for my Sunday lunch. Then an idea came in my mind. I have never ordered Pizza online. This is the time to do it. So, I was typing in Google about ordering pizza online in Bangalore. Immediately the ads from Pizza Hut and Dominos showed up as sponsored ad (also in organic search results). I chose Dominos. The site opened. I had to select city, location and sub-location. Next from the menu I had to choose any pizza item. I was confused about what to choose. There were so many veg. And non-veg. Pizzas available. Finally after much thought, I picked up Veggie Paradise and Chicken Fiesta both of regular sizes. Veggie Paradise has ingredients such as Babycorn, Black Olives, Crisp Capsicum & Red Paprika. The crust I chose was Classic Hand Tossed. The non-veg. 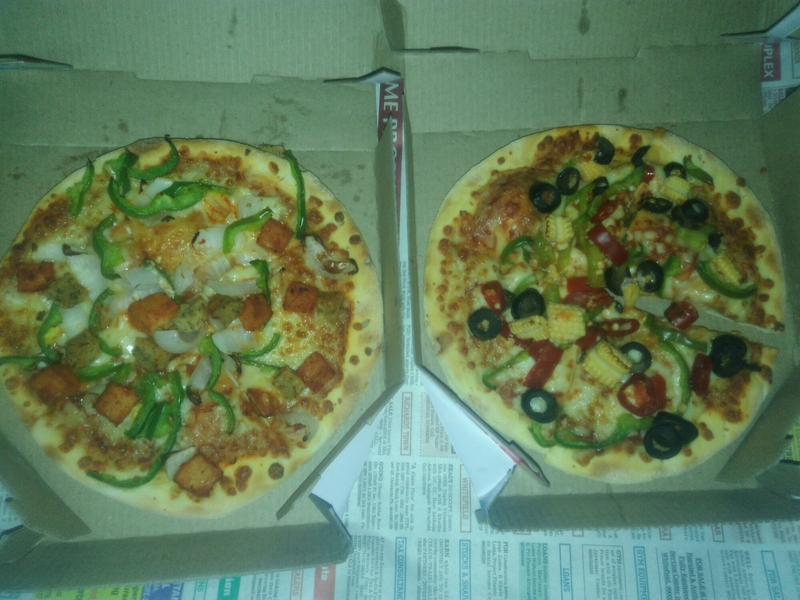 pizza had main ingredients such as Chunky Chicken, Spicy Chicken, Onion & Capsicum. The same crust was chosen for this pizza. Then the ordering part came. I saw the grand total, applied the discount and got Rs. 130/- off! Within 30 minutes of ordering the delivery boy was standing in front of my PG and calling me. Such a nice & fast delivery! I thanked Dominos pizza. 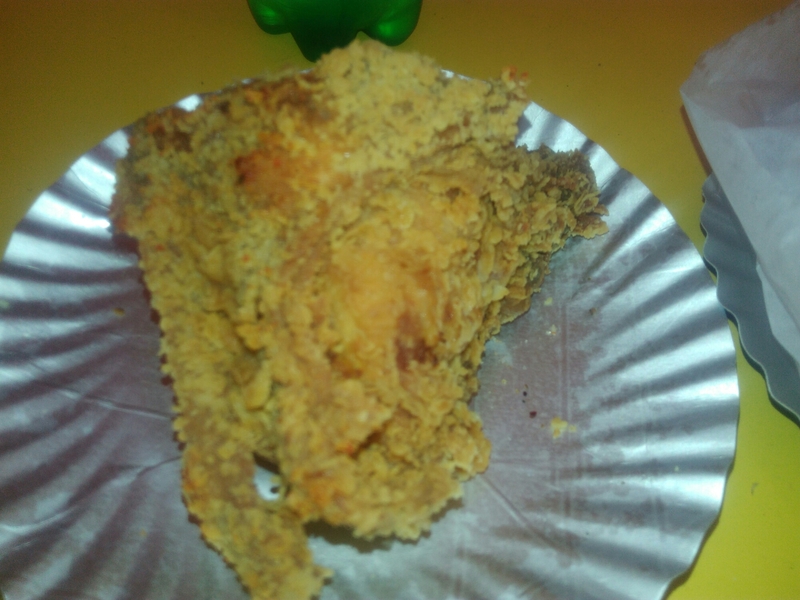 Taste: I did not get the feeling of eating chicken while eating the non-veg. pizza. But the Veggie Paradise did not disappoint me at all. It was worth its price. 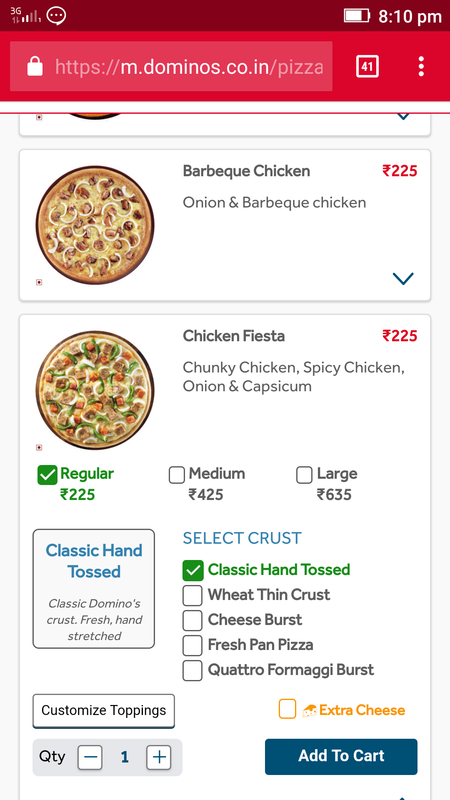 If you want to try Dominos pizza, you can check the website of Dominos India. 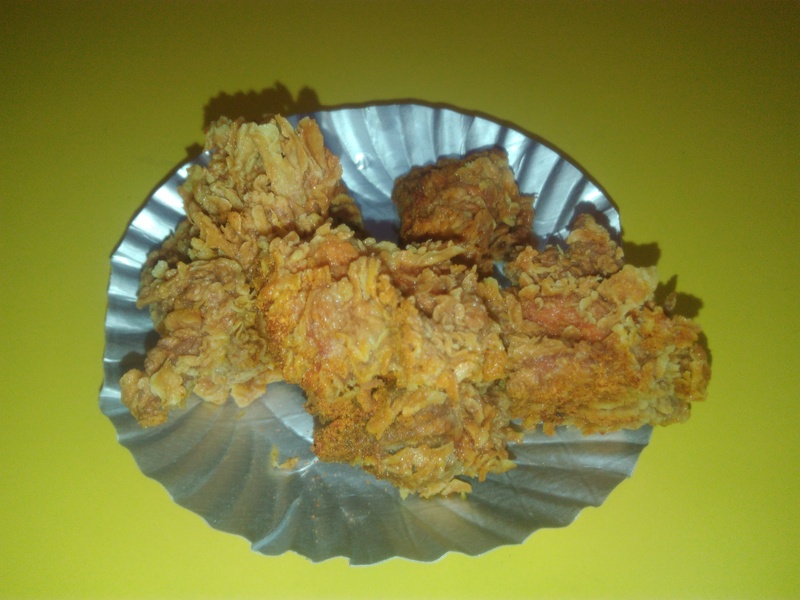 If you are a non-vegetarian and living in Bangalore (near Madiwala, Silk Board, BTM Layout or Bomanhalli) then this post is exclusively for you. 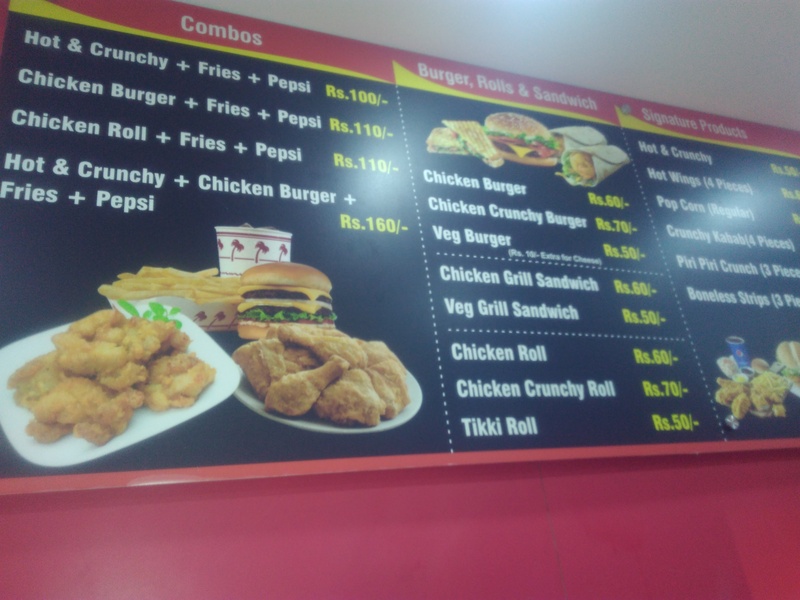 At my place, Rupena Agrahara, there is a new shop named Chicken Express. 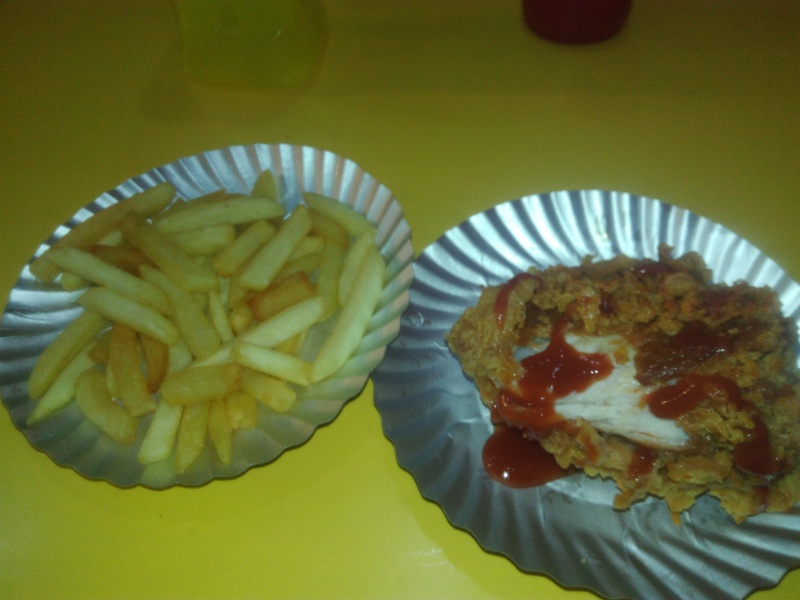 It is a paradise for chicken lovers and I have never found such a nice Eating shop even in Kolkata that specialises in chicken related fast foods. 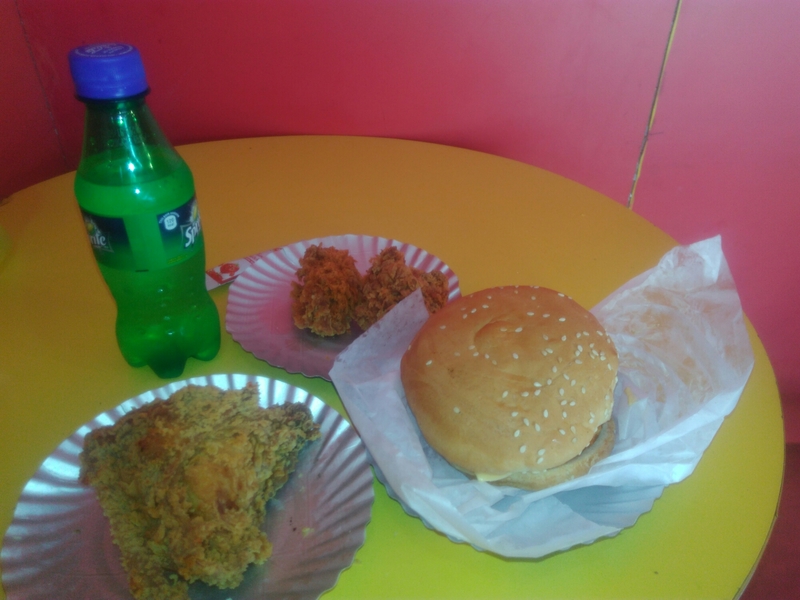 My favourite dishes at Chicken Express are Chicken Hot ‘n’ Crunchy ( priced: ₹50/- ), Piri-Piri Crunch ( priced: ₹60/- ), Hot Wings ( priced: ₹60/- ), Chicken Pop-Corn ( priced: ₹60/- ), Chicken Burger ( priced: ₹60/- ), Chicken Kebabs, etc. They also serve Chieken Biryani which I am yet to taste. 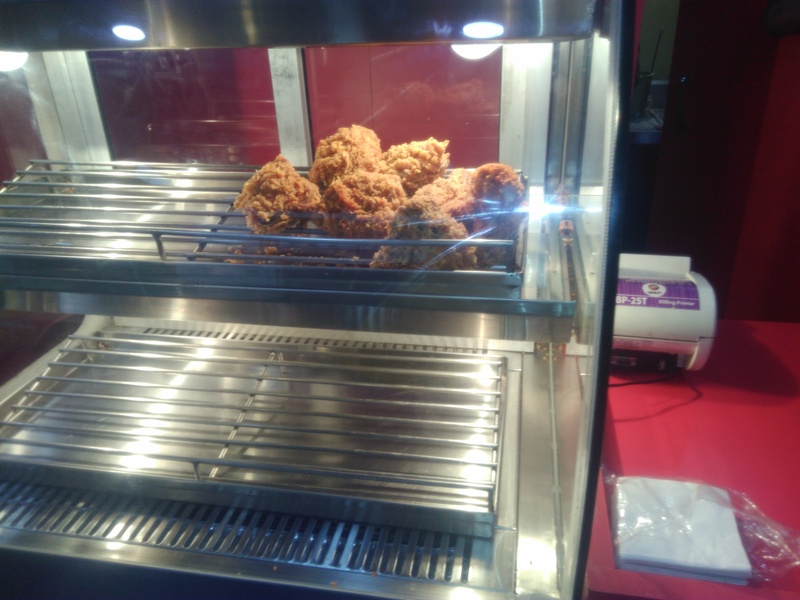 Also, the veg-fast-foods are also available at Chicken Express. The shop is a brainchild of Mr. Sundor, a young entrepreneur, who wants to serve great foods at unbelievably cheap prices. It is Sundor’s nice behaviour towards customers and good quality food that are dragging customers towards the shop. Here are the pictures of some items that I have tasted so far. 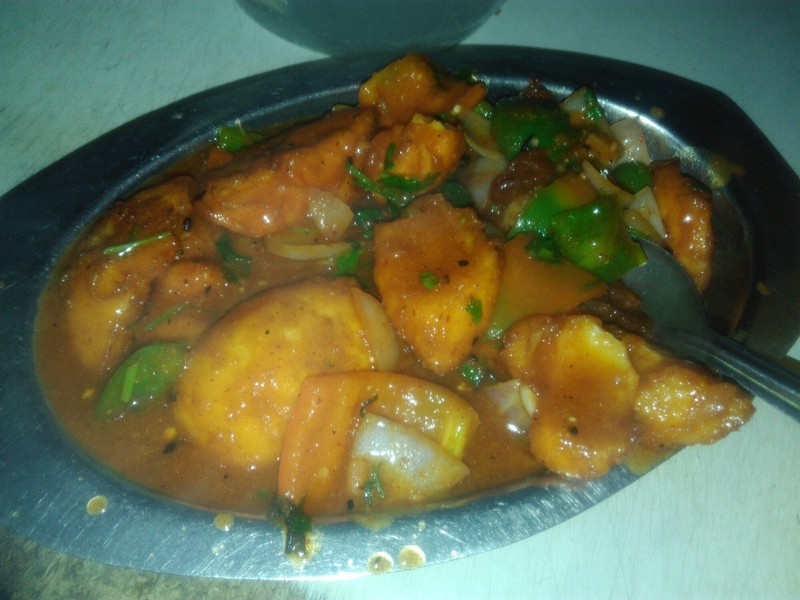 If you are fond of fish eating, the Rupena Agrahara has few shops that keep fish items in menu. But they serve fish items only on Sunday. 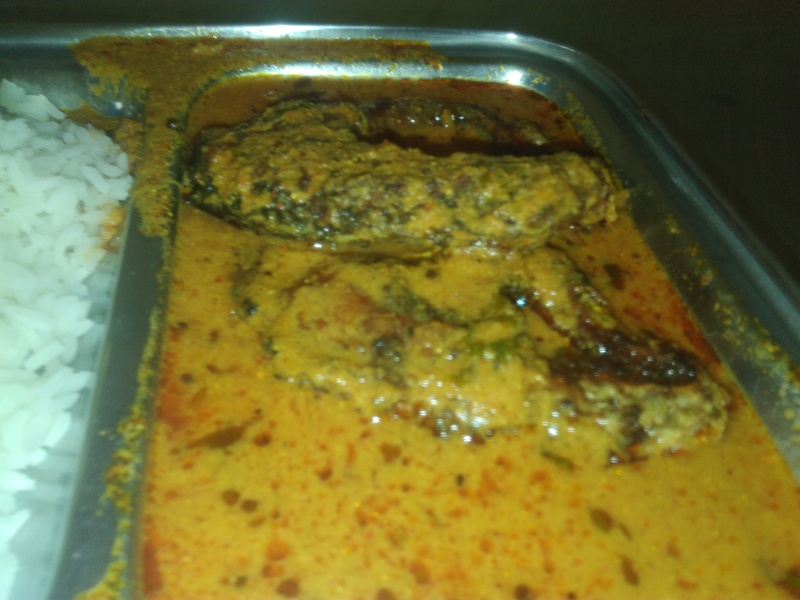 Following is a Rice with Fish Curry (priced at ₹80) I ordered at a local restaurant near Big Bazaar shopping mall. Hope you will enjoy the foods that I have described today. Most people come to Bangalore searching for jobs. But I have come to Bangalore not only to get a new job opportunity but also to adapt a new culture, eat lots of local foods and travelling nearby places. So far, the journey has been so good that i really have nothing to complain (except living with some bad boys in a male PG). What I find fascinating is its budget-friendly eating lifestyle at local hotels and restaurants. My ‘gastronomical adventure’ in Bangalore began before I got my first job. 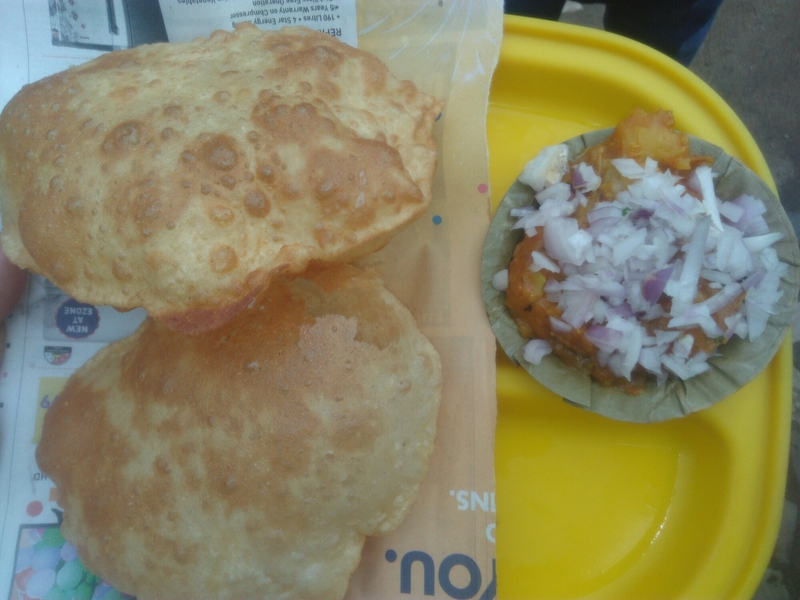 At MRA Hostel, they give Puri on every morning. Each Puri is really crispy and you can’t stop before eating at least four. As I came to Bangalore during summer, I felt thirsty on a regular basis. Bangalore ‘s local shops at Rupena Agrahara offer a variety of fruit juices. Lemon juice is the cheapest among them (₹ 10/-). However, I preferred one particular item. 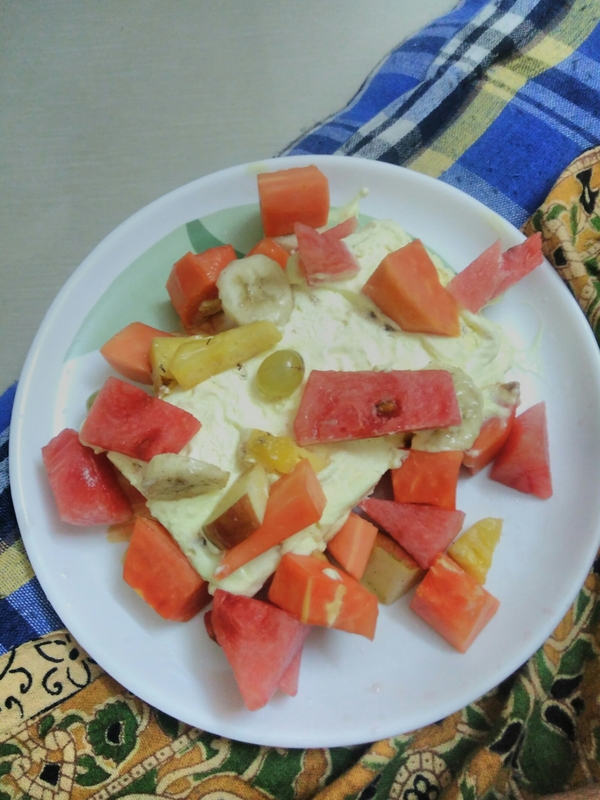 That is Icecream with Fruit Salad, priced only ₹ 30/-. Narula food centre has diverse kinds of veg. and non veg. items. All of you (vegans, vegetarians, eggetarians and chicken-lovers) will enjoy eating there lunch and dinner. I started eating there by ordering Veg. Thali (price: ₹ 45/- only) but soon shifted to Chicken Thali (price: ₹ 80/-). Occassionally I ate Aloo Paratha (price: ₹ 20/- only) and omlette made of double eggs (price: ₹ 20/- only). 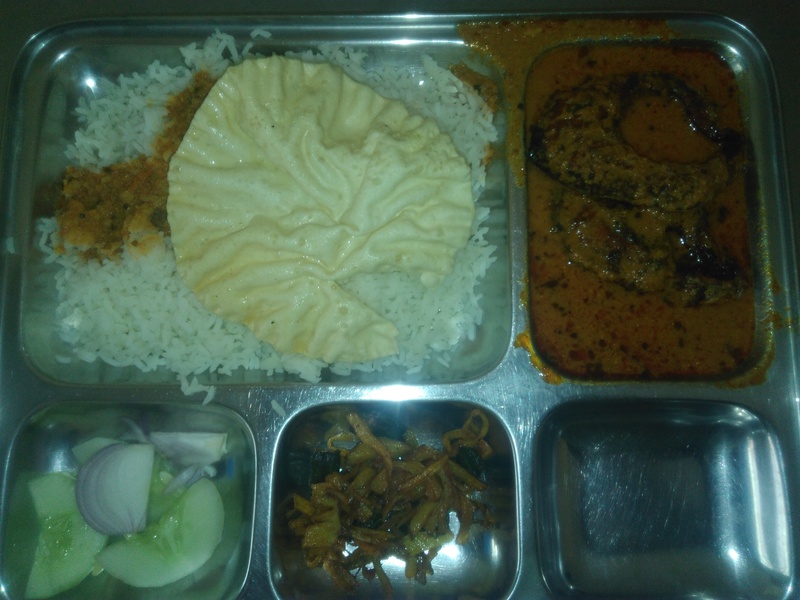 The Chicken Thali contains two chicken pieces and those are mostly boneless. Following is a picture of Chicken Thali. Another dish I liked there was Garlic Chicken (price: ₹ 80/-). 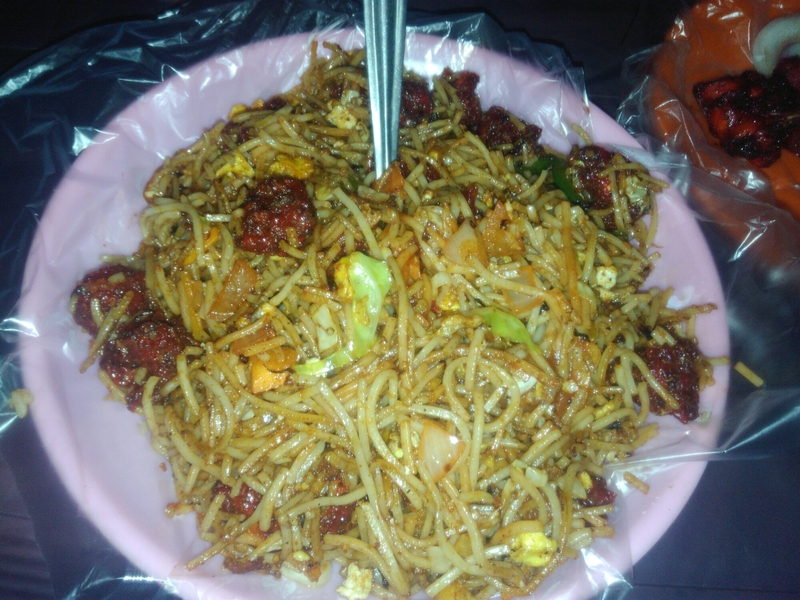 Its taste is heavenly. And I also liked the similar dish with egg called Garlic Egg (price: ₹ 80/-). 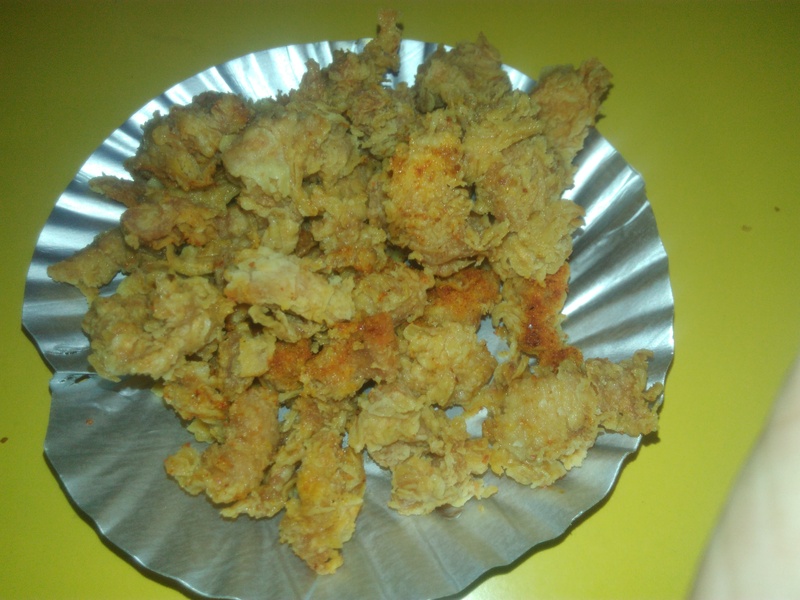 Following are images of Garlic Chicken (with Roti / Chapati) and Garlic Egg. If you can’t eat them, at least view them! Apart from MRA hostel, Narula food centre or Chinese food shop, there are other eating points like Mayura, Panjabi Dhaba etc. where you can certainly get good foods at cheap rates. During office days I can’t eat much. But on weekends, I love to experiment with new food items. 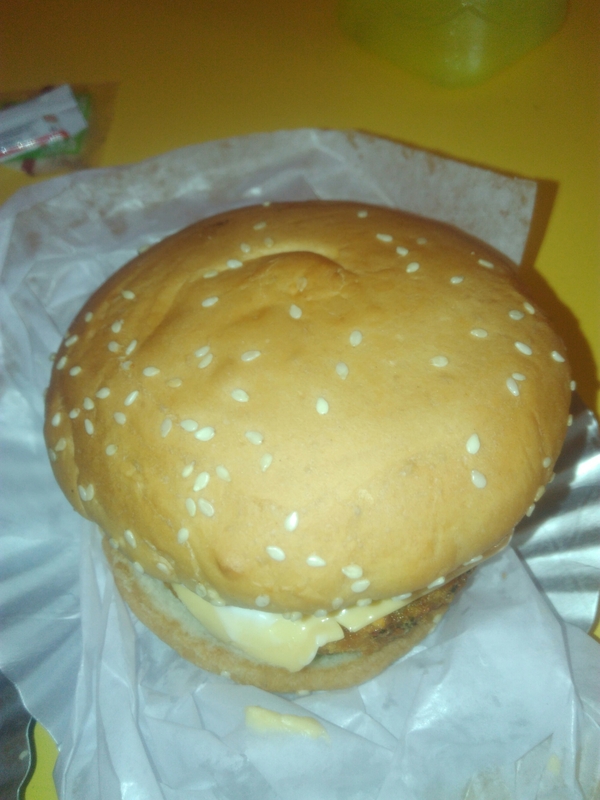 In this blog, I’ll share some more pictures of food items which are not so much costly. Also, I must say that I don’t like eating in groups. All these dishes I have tried alone and indeed enjoyed! Rather than Eating out in big restaurants, I prefer Eating in budget-friendly local hotels. And rather than taking selfies of eating with friends, I prefer to take pictures of food item. 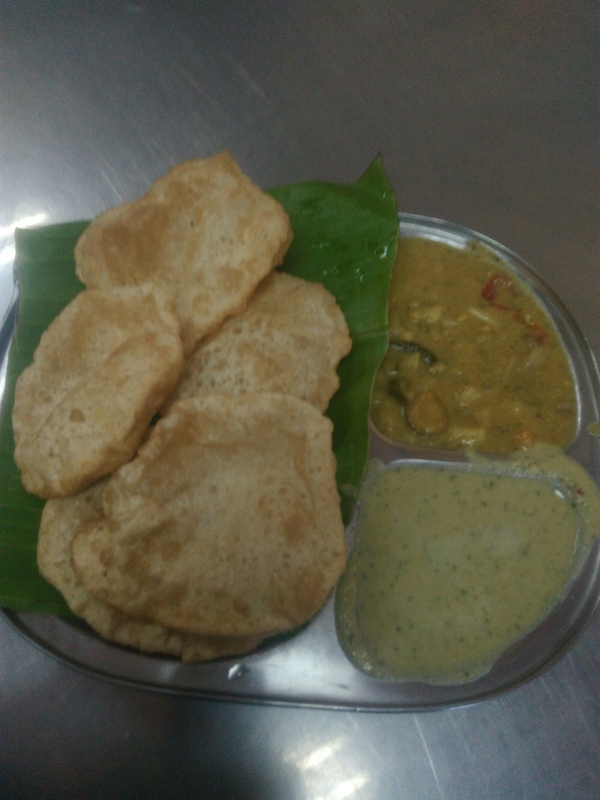 If you like this post, tell me what other cheap dishes I can eat in Bangalore, at which places those available and how much is the price. Keep posting your feedback as comments. Check back this site after few months as I may publish here one more post on cheap foods in Bangalore. Dryer Vent Cleaning: This site rocks!